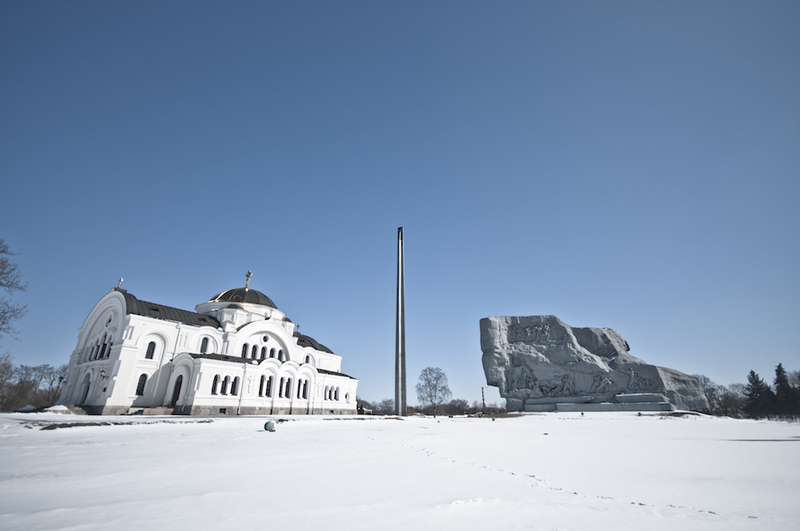 Travelling to or from Belarus is a useful lesson in the political, rather than geographical nature of borders. 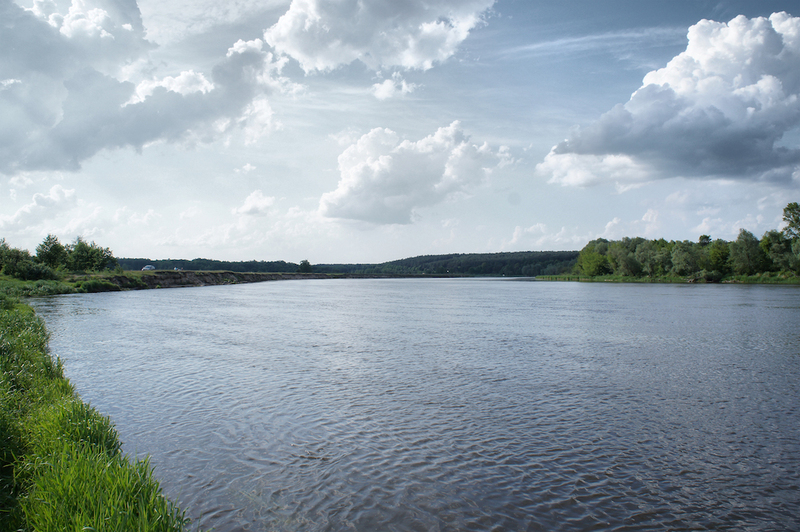 The city of Brest — Brest-Litovsk, to history students, Brześć-nad-Bugiem to Poles nostalgic for when this was part of Poland’s Kresy, its eastern borderland — is 200km from Warsaw, a little less than the distance between London and Leicester. In six years regularly staying in the Polish capital, I don’t think I ever met more than two Poles who had visited their immediate eastern neighbour, although it is far closer than Berlin, Vilnius or Prague. The train is slow, and makes several leisurely stops — waiting for around 30 minutes at Warsaw’s East Station, and then for 45 minutes at each side of the border so that the guards can check your credentials and make sure nobody is smuggling anything. Even then, the journey takes just under 5 hours, not a long journey in eastern Europe, though the Pendolino that travels between Warsaw and Krakow would make it in an hour and a half. The border is the river Bug, a geographical cipher that stands in for the divide between the Catholic and Orthodox, the nationalist and the Soviet, and now the European Union and the Eurasian Union, which the likes of historian Timothy Snyder have imagined as the cleavage in a contemporary “clash of civilisations”. Even so, you're still some distance west of Vilnius, Riga, Tallinn or Helsinki, and Brest is the only major city in the former USSR where you can leave the train before the European gauge rail are exchanged for the Russian wide gauge. Once you’ve gotten over the many bureaucratic hurdles the country’s visa regime will throw in your way, it's a good place to explore the degree to which Belarus, the “Last Dictatorship in Europe”, an “outpost of tyranny”, as it was once described by the US state department, is different from its neighbours. Belarus has had only two free and fair elections in its history, and the results of both were landslides; one, in 1991, was the referendum Mikhail Gorbachev held on the maintenance of the Soviet Union, where the result was 80% Yes; the other, in 1994, saw the election of an anti-corruption campaigner promising to restore the historic links with Russia and the Soviet symbols which a brief nationalist government had favoured after an unrequested independence, with another 80%. Alexander Lukashenko, for it is he, has been President ever since, and after forcing through a dubious referendum in 1995 giving himself sweeping powers, it would be apologism to call Belarus anything other than a dictatorship. 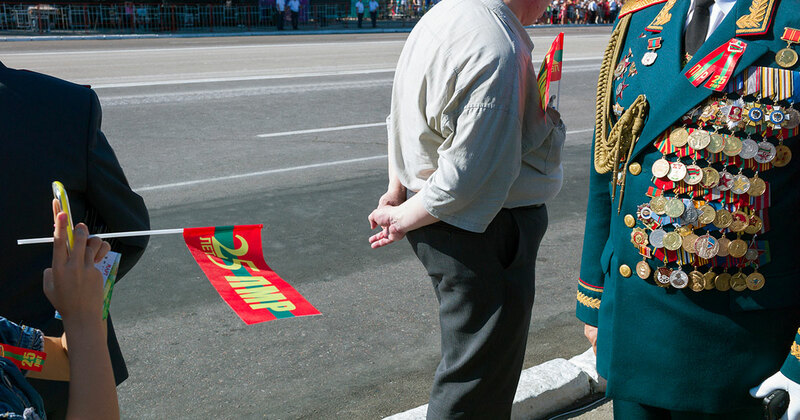 Unlike others who have made enemies of the USA, such as former Venezuelan president Hugo Chavez, who struck up an alliance with Belarus, Lukashenko has never faced truly competitive elections, and protests after the elections of 2010 were heavily repressed. Opposition candidates were jailed, and one has plausibly claimed he was tortured. However, even that election was not comparable to the situation in Ukraine in 2004, where ballot-box tampering made a genuine difference to the close Yanukovych/Yushchenko battle. Even opponents estimate Lukashenko’s actual share of the vote to have been well over 30% above his nearest rivals, something replicated at the polls earlier this year, though a couple of opposition MPs were elected to Belarus’s rubber-stamp parliament. Lukashenko’s success has been put down to many things — strong economic growth until very recently, relative equality, full employment which critics consider to be an “artificial” meddling with the market’s invisible hand, and of course, repression, censorship and the closing off of the country as much as possible in contemporary Europe. On my way in, a young border guard took a good look at the books in my bag. “Any political books?”, she asked, smiling sweetly. I smiled back, not sure if this was a shared joke or a serious question. In 1939 and again in 1945, annexed as part of “Western Belarus” or “our beloved Kresy” depending on who you’re talking to, Brest’s function shifted from a garrison town in eastern Poland to the major border city of the Soviet Union. It was the first piece of Soviet territory that a traveller on the trains from Amsterdam, Berlin and Paris would see. This would at first seem to be the reason why a city roughly the size of Hull has a railway station of such splendour. The vaulted roof of the main station hall — redesigned at the start of the 1950s — with its gilded, shimmering chandeliers, above terrazzo floors and plush, well-kept benches, shames the stations of cities ten times its size. The main facade is modelled on the Stalinist skyscrapers of the period, an open colonnade of granite columns on either side of a genuinely baroque clock-tower that is still surmounted by a Soviet wreath and star. However, if you arrive, as I did, at midnight, coming in from Poland, this isn’t what you'll see at all. Instead you'll be greeted by the earlier, 19th-century station building, based on a standardised vernacular classical design that will be familiar to many Poles — and a vague street of single-storey houses. 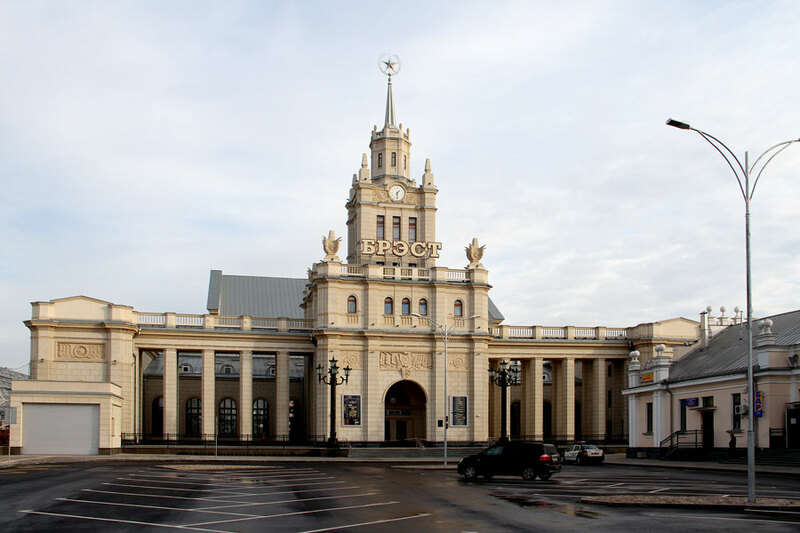 The most likely conclusion, given that this is what travellers going east see first, is that the spectacle of the station’s main facade was not intended for the visitors, to impress upon them that they’re entering the USSR. 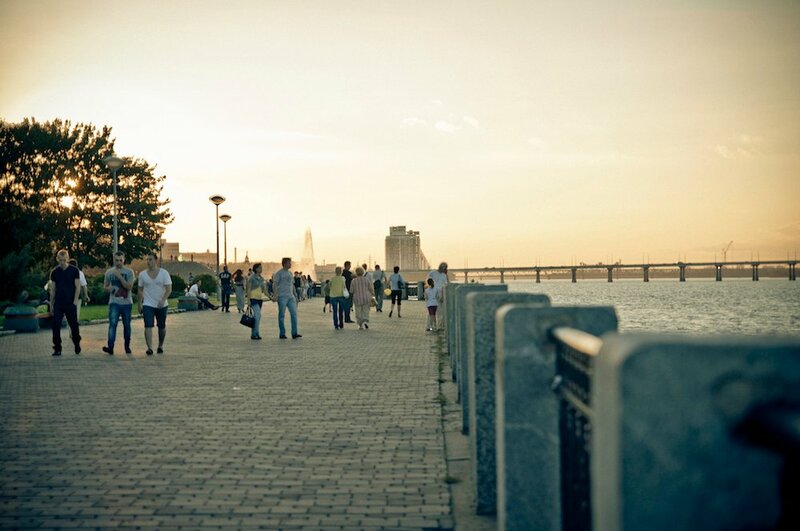 It was for Soviet citizens, as a sternly impressive gate, standing at the point of departure. I stayed in the Hotel Intourist, as is wise — “invitations” are taken seriously here, and a western European will have to book a state-run hotel first before they will be given a visa. 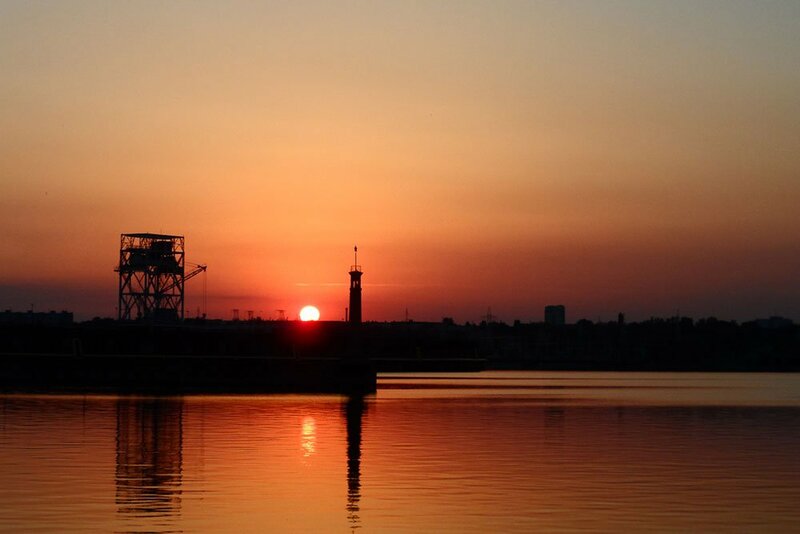 It stands in the south of the city, and gives a view of the skyline and of the extremely close proximity of Poland, the country Brest was part of for longer than anywhere else. Intourist, like everything around it, has been meticulously painted, in a bright orange and white. Next to it, past a drained fountain with bronze Soviet sprites dancing around, is the Brest Univermag, a multi-level department store designed in the 1970s as the city’s main shopping centre. In old photographs, this is a Brutalist scheme, with shuttered concrete walkways and a jagged clock-tower. None of it has been demolished but its current incarnation is painted lime green, in the pastel manner popular just over the border when post-war buildings get renovated. It houses a supermarket, travel agencies, cafes, and just round the back of it, where you’re not meant to be looking, is an ordinary but small post-Soviet market of makeshift buildings and puddles. Compared with any city of similar size in Ukraine, the relative cleanliness and affluence is noticeable; compared with any Polish equivalent, it is the lack of cheesy adverts you miss, partly the giant canvas ads for western cars and lingerie that would be draped over the bulk of the buildings, and the messier efforts of smaller traders that would crowd around the spaces left empty. Their absence doesn’t make it feel like a Soviet time-warp, as the buildings are made to look as new as possible. Freshly arranged flower patterns run alongside the walkways. Everything is neat and ordered, and that is the least one should expect from a dictatorship. Family values posters and “I Heart Belarus” looms down from the billboards as often as western brands. 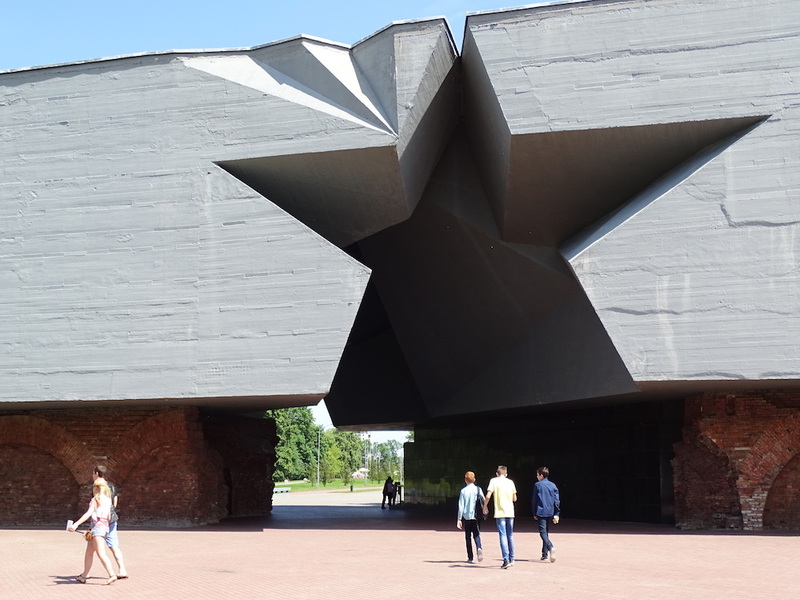 From here, you can see the city’s main attraction during Soviet times and today — the Brest Fortress, whose entrance is marked by a huge concrete slab, with a hole in the middle shaped like a five-pointed star. You can’t walk there very easily, as Prospekt Masherova — named after the former Partisan leader Pyotr Masherov, who became Belarus’s Communist Party boss in the 1960s — is currently being dug up, presumably so its pavement can be as impeccable as that around the Univermag. So instead, you’d have to improvise a route through a new housing estate of utter banality, prefabricated slabs around surface car parks, with ingratiating little details to mask the fact that this is nothing more or less than Soviet housing without the green space or the social planning. It’s identical to mass housing in contemporary Russia and contemporary Ukraine, with dictatorship in one, “managed democracy” in another and an oligarch-dominated democracy in another, all creating seemingly identical urban results. There are Soviet blocks on the other side of the road, not as dilapidated as in Russia or Lithuania but not as nicely renovated as in Poland. A large power station, and then a dual carriageway cuts you off from the Fortress entrance — this is the main route from Paris to Moscow here, you don’t cross it lightly. But when you do, you’re in another world. The Soviet Union named several “Hero-Cities” for their deeds in the Great Patriotic War — Moscow, Leningrad (now St Petersburg), Kiev, Odessa, Volgograd, Sevastopol, among others — but Brest is the only “Hero-Fortress”, a title bestowed not upon the city, but upon a large military complex constructed during the Tsarist Empire. A system of bastions and concrete outposts around a red-brick Gothic core, it was one of several in eastern Poland, useful both for military purposes against an invasion from the west and to repress the restive Polish population. Yet it became particularly notorious after Polish independence when re-used by the government of a former Tsarist political prisoner; the Polish dictator Jozef Piłsudski imprisoned his centre-left opponents there in the run up to the rigged elections of 1930. The opposition press nicknamed it “the Brest election”. In 1939, the fortress was taken by the Nazis, who then transferred the town and its environs to the USSR as part of the Molotov-Ribbentrop pact; the ceremonies on the day are unsurprisingly remembered by many Poles as a Nazi-Soviet joint victory parade. Barely a year and a half later, Operation Barbarossa started here. The fortress held out for a week until it was crushed, and the commander, Yefim Fomin, was immediately shot, perhaps the first victim of the “Commissar Order” that mandated the killing of Jews and communists. The memorial there now was designed in the mid-1960s, and opened on the 30th anniversary of the siege, in 1971. 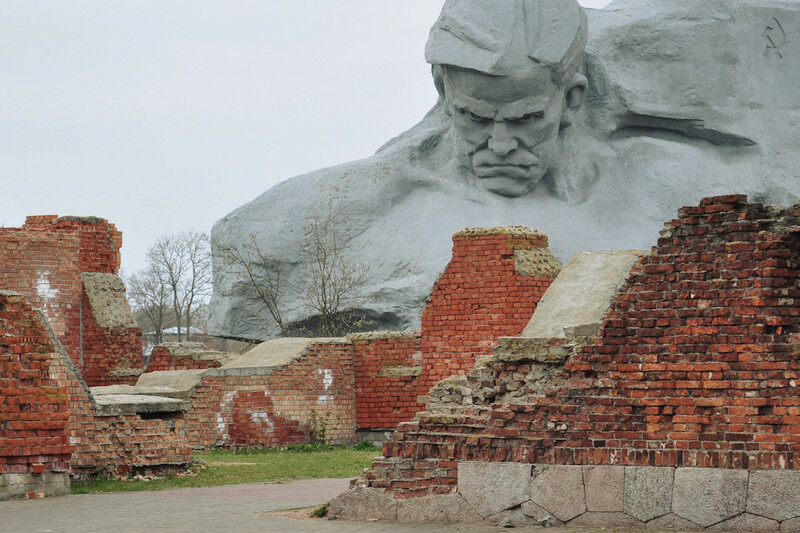 The Brest Fortress memorial is one of the most stunning Soviet monumental spaces I have ever seen, and I have seen many — a masterful, authoritarian manipulation of the emotional possibilities of architectural space. 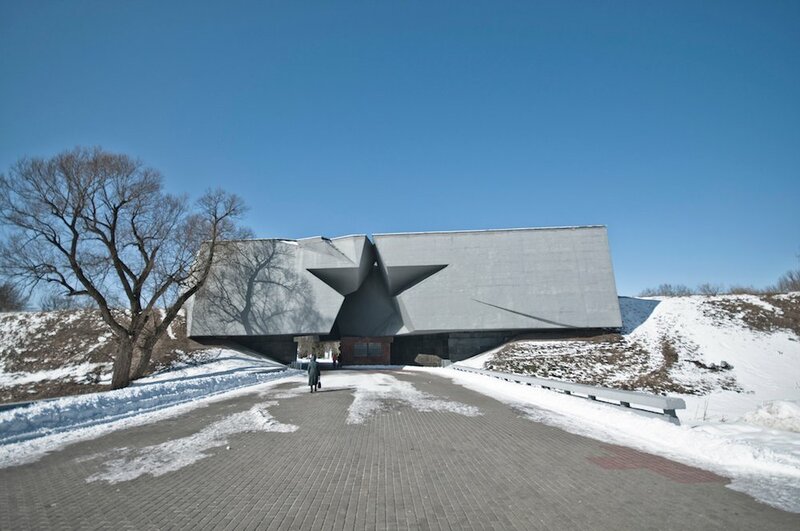 What you see from the road is the long, rectangular concrete slab (painted — no bare concrete allowed to be seen here) with its cleared star-shaped space. As you move towards it, you can hear a metronome ticking away. Inside the “star”, and you notice on either side that this concrete star-as-absence is actually twisted into several polygonal parts, an anticipation of the belief held by Daniel Libeskind among others in the 1990s that non-orthogonal geometry and war had some natural affinity (and not the only time Soviet memorial architecture has shades of a less tasteful precursor to “Deconstructivism”). The crushed concrete volumes are cantilevered out across the remains of one of the Fortress’s brick gates; you can see the empty rooms and corridors inside, in enfilade. The outline of the star, suspended above you, frames perfectly a steel obelisk, and the giant concrete bust of a seemingly growling soldier, so deranged in its scale you don’t know whether to laugh or shudder. The metronome stops, and turns to a recording (reconstructed?) of the Fortress’s garrison calling Moscow. And then the ubiquitous, terrifying marching song of the Great Patriotic War, “The Sacred War”, calling to the hairs on the back of your neck. Like so much in the iconography and self-justification around the Soviets’ war, it is hard to regard any of it with equanimity and acceptance, let alone the total submission that it demands. The giant figures — the snarling bust, and, just out of view to the left of the star, a concrete soldier reaching his helmet out to the moat, called “Thirst” — are so literal and domineering that they almost neutralise the moving effect of the scattered ruins of the Fortress complex, and the smaller plaques to its defenders. A plaque to Yefim Fomin is on the Fortress's original main gate. The gate is so riddled with bullets and potholed by mortars that it tells the story the architects of the complex want to tell you — about astonishing violence, astonishing fortitude — without needing to spell it out as the statues do. 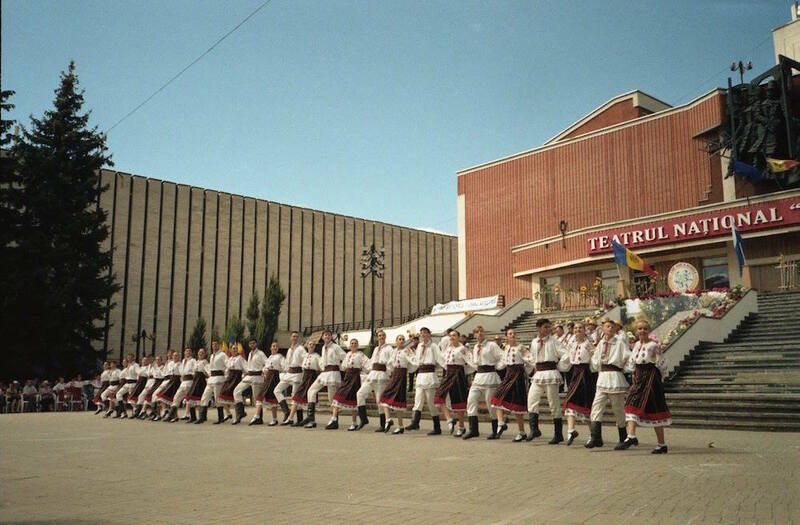 Young conscripts stomp in formation in the very large square between the star and the giant head; and behind the latter is a tacky, reconstructed version of the 19th century garrison church that was destroyed in siege, which Fomin and the other multi-racial defenders of a state based on a harshly atheist ideology might have been upset about. A small museum inside the Fortress’s barracks has one room on the 19th century, one on the interwar years when this was in Poland (curiously missing the own goal provided by Piłsudski’s use of it to jail opponents), and a half-dozen rooms on the Fortress’s defence, and its defenders. As always with these places, propaganda and real horror and heroism intersect, inextricable — a ludicrous painting here, a set of haunting photographs of victims there. The gift shop features fridge magnets, plates and a variety of other Red Army-themed consumer goods featuring the complex; you know you’re not in Russia largely due to the absence of images of “Krim Nash” (Crimea is Ours) and Vladimir Vladimirovich, and the interesting absence of the Orthodox, Tsarist iconography that, in Great Russia, is now conflated with that of the USSR. The Museum of the Fortress is careful to credit its defence not to “Russia”, but to “the people of more than thirty nationalities”. As it was. 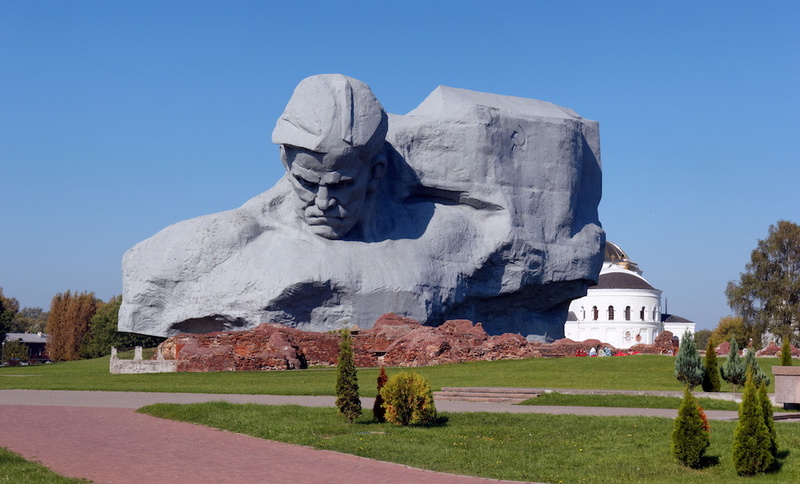 Nothing else in Brest can compare with the experience of visiting the Brest Fortress. Gogol Street leads from there to the centre, through some more poor-quality new housing, much of it evidently on post-industrial land, and then a delightful tree-lined prospect, whose central avenue works as a linear park, fresh, spick and span. In Poland or the Baltic states, you'd assume this was funded with EU money, here it’s the astute use of Russian subsidy, to much the same pretty and conservative effect. Compared to the real economic failures of the “transition” — Ukraine, Moldova, Georgia — the evenness of the streets and the cleanliness of the buildings is something of a marvel, though head off the main road and you’ll find a relative shabbiness, with un-renovated panel slabs shadowing interwar Polish houses, their modernist lines hidden by ivy. Eventually the street becomes a park, and then Lenin Square, with a standardised statue of the leader of the Great October Proletarian Socialist Revolution pointing to a twin-towered Catholic church, another little piece of Poland standing as the odd man out in a square of monumental classical offices. Around Pushkin Street, you're in a small-scale city that could be absolutely anywhere between Łódź and Smolensk, streets of little houses and two-storey tenements, with unfussy 1950s additions in a delicate classical style. New buildings are uniformly hideous, with new constructions stuck in an eternal 90s of mirrorglass shards and stone-clad “references” to the historic past. Then you come to Brest’s main drag, Soviet Street, heralded by the glass rotunda of Kinoteatr Belarus. Its free, Khrushchev-era modernist plan is actually dictated by the shape of the foundations of Brest’s Great Synagogue, destroyed by the Nazis. Brest’s Jewish population in 1936 was over 20,000, which then made up 41% of the city; nearly all were killed. Oddly enough given the circumstances, the recent reconstruction of Soviet Street aims at a weird Disneyland Shtetl style, with fibreglass candelabras, Fiddler on the Roof street furniture and a plethora of inept approximations of picturesque pre-war architecture, housing cafes and boutiques. It is strange indeed to see pretty wood effect street signs with curlicues and gilding which, just a few miles away would say “John Paul II Street” or “Jozef Piłsudski Square”, here reading “Komsomol Street” and “Felix Dzerzhinsky Street”. In Belarusian. Everything has changed but the nomenclature. As in Russia, or anywhere else, nostalgia has been incorporated into consumerism. 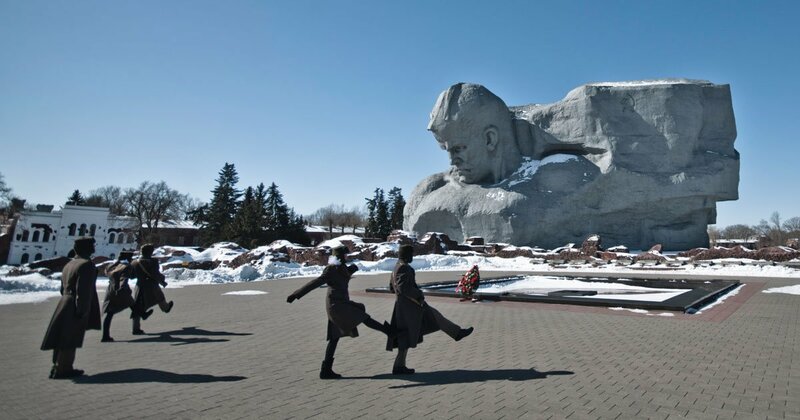 While at the Brest Fortress this takes on unusual forms, with Soviet memory perpetuated on an enormous scale, that is what Belarus has to hand, its useable past. Looking at Soviet Street, that memory, and the retained names coming with it, is the only thing that tells you you’re not in the European Union. All those brutally enforced borders, immortalised by a monument right at the border crossing — and this is what you find on the other side. 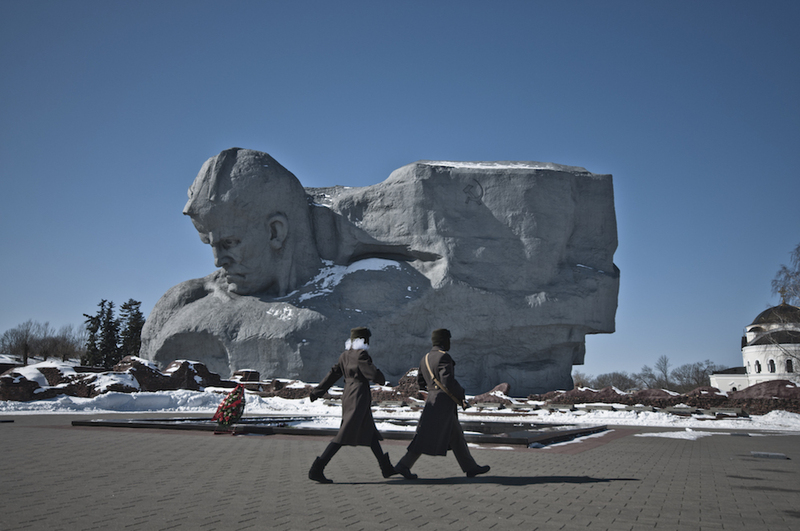 Letter from Bălți: is Moldova’s forgotten second city poised for a comeback?